Manufacturers of exterior coatings — paints, stains and clear finishes — make all sorts of claims, usually centered around how long the coating can be expected to last. But there’s no way we can know if the claims are true. There are differences in quality and the way a coating is made, of course, but you’d have to be a coatings chemist and have access to everyone’s formulations to be able to compare and judge intelligently. Even if you were a chemist, it’s not likely any company would give you its formulation. Making the judgment even more impossible, the weather conditions where the coating is used and the quality of the preparation are bigger factors than the quality of the coating anyway. So the claims, even if true for one situation, might very well not be true for yours. So what’s the best you can do in choosing a coating? Exterior is different than interior primarily because of exposure to sun and rain. Sunlight is high in ultraviolet rays and is very destructive to coatings and wood. The UV light breaks down coatings so they dull, powder and crack. It breaks down the lignin in wood so the color turns gray and the cellulose fibers separate. The surface of the wood becomes fluffy to the point where you can scrape off some of the fibers with your fingernail. The frequent wetting and drying of wood causes it to shrink and, if this occurs only to one side as on decks, the wood warps. Eventually, the stress of one side shrinking causes splits. If the wood isn’t naturally rot-resistant or pressure-treated, it rots. The goal of a good-quality coating is to block UV light and water from getting to the wood for as long as possible. No matter which coating you use, wood prep is critical. The coating needs to bond well or it can’t achieve its purpose no matter how good it is. Good wood prep means the wood should be dry and most of the fuzzy gray fibers removed if recoating an old surface. Sanding works best, but it’s too much work for most exterior situations. So most people remove the worst of the damage by pressure washing. This works decently well, but the wood then needs to dry out before being coated. There are four large categories of coatings for exterior surfaces: paint, clear film-building finish, stain and clear non-film-building finish. Though you might not be able to choose a brand within a category intelligently, you can definitely choose the best category for your situation. Paint is by far the best because it contains the elements that best block both UV light and water. The pigment blocks the UV light and the film thickness blocks water penetration. Paint can last for many years if the surface has been prepared well and the areas where water can penetrate (mostly cracks or gaps where siding butts onto trim) have been filled well with caulk. If these cracks and gaps have not been blocked off, water will enter, work its way under the paint film and cause it to peel. Clear film-building finishes don’t work as well as paint because there’s no pigment to block UV light. They break down fairly quickly in sunlight, first dulling then cracking and letting water through. The alternative for pigment in these coatings is UV absorbers. They break down the UV light before it can get to the wood. If the wood is reached, the lignin breaks down and the finish separates and peels, pulling the detached surface cellulose fibers with it. Many manufacturers claim UV resistance for their clear coatings. But, in my experience, the only clear finishes that contain enough UV absorbers to be effective are those from marinas. They are much more expensive, but they work fairly well if five or more coats are applied and they are recoated whenever the surface begins to dull. (These finishes are almost always high-gloss to reflect the UV light better). To recoat, first sand off the dull surface. Then apply several more coats. This is a lot of work. Boat owners are usually willing to do it and spend the money to keep their wood in good condition. You might also be willing on a surface such as an exterior door exposed to direct sunlight (no storm door). Clear film-building finishes aren’t a good idea for decks, tables, chairs, fences and exterior panel doors exposed to rain, however, because there’s no way to keep water from getting under the finish and causing it to peel. 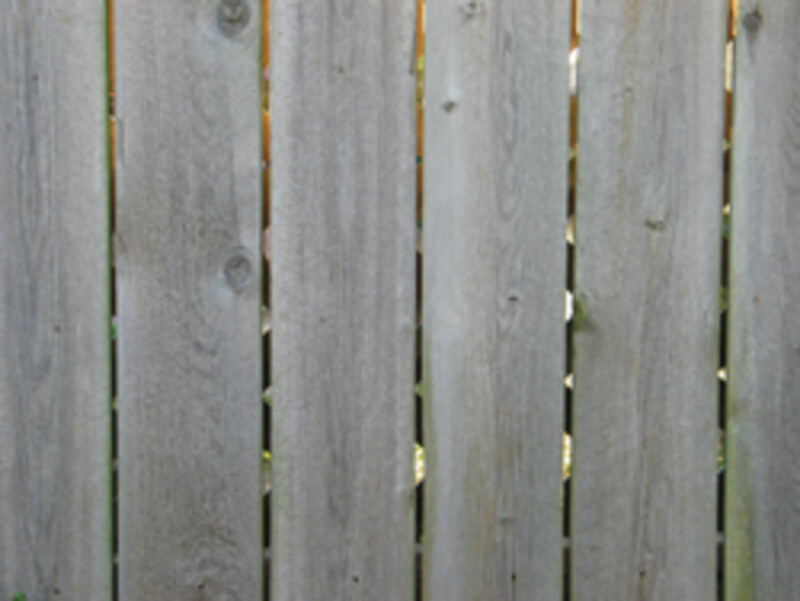 Stain contains some pigment, so it is somewhat effective at blocking UV light, but there’s very little or no film build. This results in water working its way through relatively quickly. The stain breaks down and should be recoated, maybe as often as every year or two, depending on wear and weather conditions. The advantage of stain over paint is that it doesn’t peel, so preparation is much easier. Usually, a quick pressure wash is sufficient. Then let the wood dry and apply another coat of stain. If kept up and if the wood underneath is naturally rot-resistant or pressure-treated, its life span can be many years. Because there’s no way to caulk decks, tables, chairs or fences to keep water from getting under a film-building clear or pigmented coating, stain is usually the best choice for these surfaces. Clear non-film-building finishes are those that don’t dry hard. So all the excess has to soak in or be wiped off or they will remain sticky — that is, not functional. These finishes include oils, oil-varnish blends and water repellants. Because of their thinness on the wood, they are ineffective against both water penetration and UV light. Water can work its way through easily and there’s not enough film for UV absorbers to have any significant impact, even if they are included. Clear non-film-building finishes can make beautiful rot-resistant woods, such as redwood, teak or ipe, look good because they richen the color, but these woods will begin graying, warping and splitting within a few years, depending on the weather conditions. 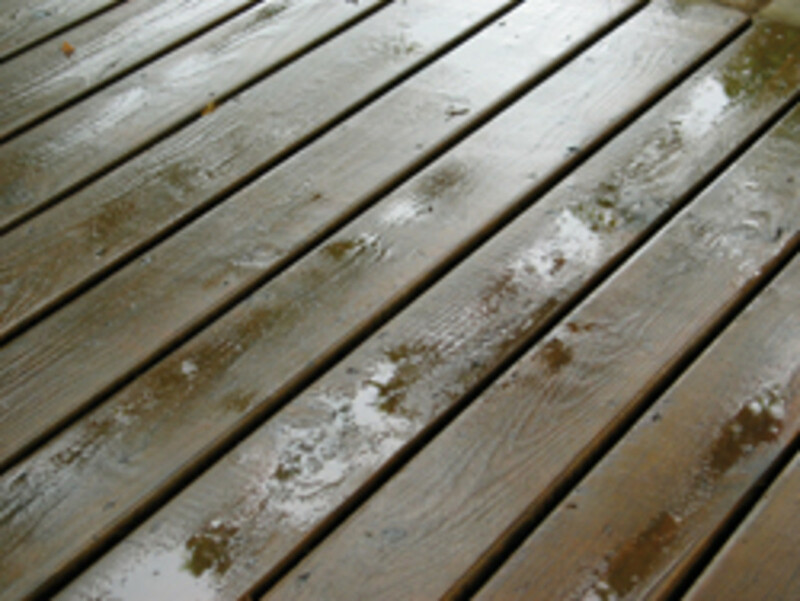 The best you can do with these woods is pressure-wash and recoat whenever the wood begins to lose its color. This might be worth it to preserve the beauty for a while. Then you can always revert to a stain.